AUR450C Dynamic Self-Checking Burner Controller. The AUR450C Dynamic Self-Checking Burner Controller is designed for continuous operation and batch operation. It is used in combination with the AUD300C Advanced Ultraviolet Flame Detector or the AUD500C Explosion-Proof Advanced Ultraviolet Flame Detector. 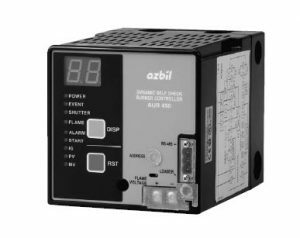 It is a combustion safety controller that automatically ignites a gas burner or a oil burner in the correct sequence and in a safe manner, and also monitors the burner. The AUR450C, by driving the shutter of the AUD300C/500C, monitors combustion conditions while continuously checking the tube unit and the flame detection circuit. A 7-segment display on the front panel and a communication function are provided for convenient maintenance and troubleshooting. The 7-segment display shows the flame voltage, sequence code, and alarm code.